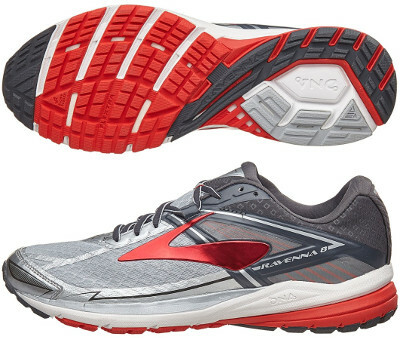 Brooks Ravenna 8 are stability cushioned running shoes. The more responsive Brooks Ravenna 8 joins 2017's update of the cushioned stability range from the american brand along with the more versatile Adrenaline GTS 17 and premium Transcend 4. Keeping great blend of cushioning and support, current 8th edition slightly drops weight looking for an improved response to smash personal best times in distances up to marathon. Upper follows trend from its predecessor Ravenna 7 with simplified saddle construction wrapping midfoot from heel and providing a custom and secure fit. Seamless design provide great comfort and breathability to keep foot dry. Midsole cushioning relies on well known plush (but resilient) BioMoGo DNA foam combined with segmented crash pad for better shock absorption. Progressive pronation control is provided by Diagonal RollBar (DRB) for a more natural ride and TPU unit located in the midfoot (DRB Accel) for balanced support and torsional rigidity. New outsole design is very similar to Launch 4 one with more blown rubber and horizontal grooves in the forefoot for improved flexibility while cross shaped midfoot promotes a quicker transition.